Entering Reports become easy and intuitive. Reports are easily accessible across all devices. development, speech to text technologies and IBM Watson cognitive computing for easy mobile content reporting and capture. CCATi allows on site road crew to dictate road condition data directly into a report by simply speaking to their phone. 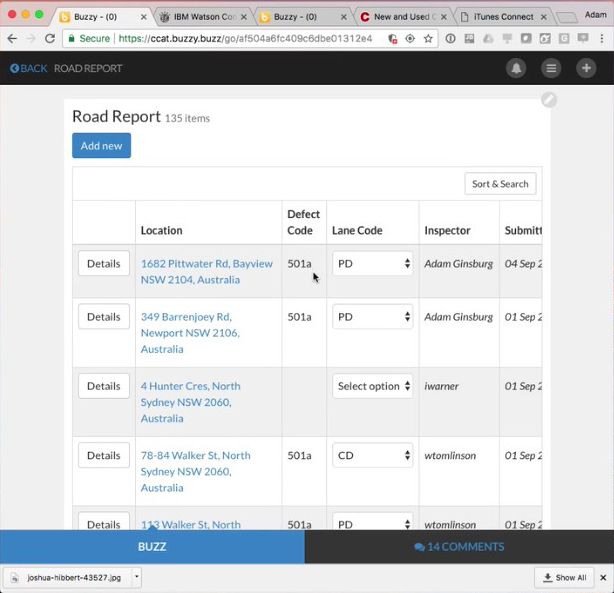 The road report captures GPS data, photos, defect codes, user ID for review and actioning. Once reviewed, the record can be filed into the asset register and/or converted into a job request. The voice-to-text and key-word analysis powered by IBM Watson rapidly improves data consistency and removes human errors associated with manual form entry. The convenience offered to on-site crew can allow a single operator to complete the tasks that currently require two.